For fighter info, see Fox (SSB), Fox (SSBM), Fox (SSBB), Fox (SSB4), and Fox (SSBU). "Fox" redirects here. For the Persona 5 character who uses Fox as a codename, see Yusuke Kitagawa. Official artworks of Fox from Star Fox 64, Star Fox Command, and Star Fox Zero. Fox McCloud (フォックス・マクラウド, Fox McCloud) is the main protagonist from the Star Fox series and leader of the Star Fox team. The son of James McCloud, Fox is an expert pilot and has saved the Lylat System from numerous threats. As a member of the "perfect-attendance crew", Fox has been featured as a playable character throughout the entire Super Smash Bros. series. His voice actor in Super Smash Bros. and Super Smash Bros. Melee is Shinobu Satouchi during the fights, and Steve Malpass during the cutscenes in Adventure Mode and the Star Fox Smash Taunt. In Super Smash Bros. Brawl, he is voiced by Jim Walker and Kenji Nojima. However, in Super Smash Bros. 4, his voice actor was replaced by his voice from Star Fox 64 and its 3DS remake, Mike West. Fox McCloud made his appearance in Star Fox (Starwing in PAL regions) for the Super Nintendo Entertainment System in 1993. The leader of the Star Fox team, Fox led his team through the Lylat System to save it from the evil Andross. The game was tremendously successful and has led to several sequels. Although Star Fox 2 was completely finished, it was canceled because of the Nintendo 64's impending launch and said system being more cost effective in regard to developing polygonal games. Instead, Fox McCloud would return in the Nintendo 64 smash hit Star Fox 64 (Lylat Wars in PAL regions) which revealed some key details about Fox's past in this reboot of the series. Fox McCloud's father, James McCloud, who was renowned as one of the greatest pilots of his time, was the leader of the original Star Fox team. Upon investigating the planet Venom, James was presumed killed by Andross. 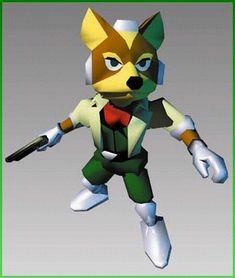 Seeking to avenge his father, Fox McCloud formed a new Star Fox team which consisted of Falco Lombardi, Peppy Hare (who was a member of the original team), and Slippy Toad. At the end of Star Fox 64, Fox independently fought and killed Andross at the end of the adventure. After this, Fox McCloud would be featured in his first fighting game in the original Super Smash Bros. and has appeared in every installment of the series since. 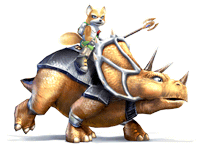 Fox would then be featured again in Star Fox Adventures with a new Star Fox member, Krystal, which was a departure from the original Star Fox games as it was more of an action/adventure game, which saw Fox rescuing Dinosaur Planet from (unknown at the time) Andross who was seeking to revive himself after the Star Fox team became a pale shadow of its former self. After this, Fox would return in Star Fox Assault, which saw a reinvigorated Star Fox team saving the galaxy from a new threat called the Aparoids. A year later, Fox would return in Star Fox Command. A few years later, Fox returns in the Nintendo 3DS remake of Star Fox 64. Five years after the release of the Nintendo 3DS remake of Star Fox 64, Fox and his team return in the Wii U game, Star Fox Zero. Fox has green eyes which sometimes appear to be blue, orange-brown fur, and his golden-brown white-highlighted hair is cut into a crew cut. The rest of his skin is a cream-colored tone. He additionally has a bushy white-tipped tail which appears to be very short in Star Fox 64 and Command, implying that it might have been cut off at a certain point. Fox is of medium/short height and medium weight, but this is contradicted in the Super Smash Bros. games, where he is a mid-sized target, but additionally very light. Before Star Fox Adventures, Fox's eye color was inconsistently erratic. In-game, it was yellow-orange in Star Fox, but blue in puppets and most artwork (and infrequently green). It is also blue in Star Fox 2, which was originally in development for the SNES. It was black in Star Fox 64 (along with the other characters), and given a consistent green afterwards. Fox is an overall vigorous and loyal bellwether. Albeit scarcely of a cocky rogue with a propensity to disregard rules and regulations (and to repine if he's not being paid enough), he is ultimately, according to Star Fox Adventures, "pure of heart". Fox is shown to be very protective of his friends, as visually perceived in the games, of his team. Fox's countenance is always either a stoic look or cocky smile. In contrast to his personality and traits portrayed in Adventures, Star Fox: Assault depicts Fox as a professional and decisive mercenary. 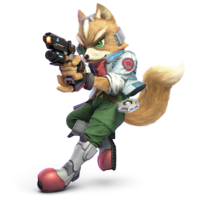 Official artwork of Fox in Super Smash Bros.
Fox McCloud was one of the four characters chosen by Masahiro Sakurai for the proof-of-concept of Super Smash Bros. as a crossover party-fighting game, along with Mario, Donkey Kong, and Samus Aran. He appears in the original Super Smash Bros. as one of the starting eight playable characters. He is based off his appearance in Star Fox 64. Fox McCloud is a nimble and fast character. His neutral special move is the Blaster, which sends one powerful energy beam at his opponents. His up special is the Fire Fox which envelops Fox in flames and sends him flying in any direction. His down special is the Reflector, which serves as both an offensive and defensive move (it reflects any projectiles that come in contact with it). Fox ranks 4th on the tier list. Following his dead father's footsteps as the young leader of the Star Fox Team, Fox McCloud's piloting of the super-high-performance combat ship ARWING for the Lylat System is still fresh in our memories. His one weakness may be his difficulty earning the trust of his teammates. In the game's single-player mode, Fox is fought on the third stage, the battle being on his "home stage", Sector Z. 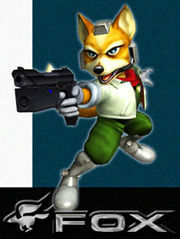 Fox, as he appears in Super Smash Bros. Melee. Fox McCloud returns in Super Smash Bros. Melee, retaining his role as a starting playable character. He is based on his appearance in Star Fox 64. His moveset has not changed much, though his blaster has changed. The blaster will not cause his enemies to flinch, but he can now rapid-fire his blaster without having to recharge it. His new side special move is the Fox Illusion which causes Fox to rush ahead in a blur and can be used as a recovery move. He is currently ranked 1st on the tier list due to countless shine techniques (such as the shine spike which can easily gimp characters, and the waveshine which can combo and rack up damage), and amazing matchups, lacking any negative ones. In Melee's Adventure Mode, Fox is fought on the Corneria stage. After he is beaten, the player will then have to battle Fox again, this time with back-up from his wingmen. However, if Fox is beaten quickly and has unlocked Falco, the player will battle Falco instead of Fox. Event 13: Yoshi's Egg: As Yoshi, the player must protect a Yoshi Egg from Fox, Pikachu, and Donkey Kong on Rainbow Cruise for 55 seconds. Event 20: All-Star Match 2: Fox is the final opponent the player must fight in this series of staged battles. The player's character battles him on the Corneria stage, and the player's character has 2 stocks while Fox has 1. With a timer of four minutes, the player must defeat him and the other four characters with the overall time and life the player has: Samus, Link, Zelda, and Captain Falcon. Event 23: Slippy's Invention: The player must battle Fox and Falco on the Venom stage, but they are both equipped with a permanent Cloaking Device. Each character has 2 stocks each. Event 36: Space Travelers: As Ness, the player faces Samus, Kirby, Fox, Captain Falcon and Falco. Ness battles the first three on the Fourside stage while fighting the last two on Battlefield. Each character has one stock. Event 43: Birds of Prey: As Fox, the player faces Falco and Captain Falcon on the Big Blue stage (friendly fire turned off). Fox, as a playable character, is given three trophies. His normal trophy is acquired by beating the Classic mode with Fox on any difficulty, and Fox's Smash Red and Smash Blue trophies are acquired the same way by beating the Adventure and All-Star modes, respectively. Fox, as he appears in Super Smash Bros. Brawl. Fox McCloud is a starting playable character in Super Smash Bros. Brawl. His design is a mix between his Star Fox Assault and Star Fox Command appearances, but his fur has the color scheme from Star Fox 64. It is also the first Super Smash Bros. game where Fox's eyes are their proper color (green). His special moves are unchanged. Fox additionally now has a Final Smash, in which he summons the Landmaster tank. Fox gets in and the player directly controls the tank to hover, fire shots, roll, and move. The tank is treated like a platform, so characters can actually stand on top of the tank. Jim Walker, his Star Fox Assault voice actor, voices Fox in English; while by proxy, his new Japanese voice actor Kenji Nojima voices him in Japanese by that proxy as well. Fox was nerfed in Brawl, but is still relatively high on the tier list - ranking 15th place in C tier. 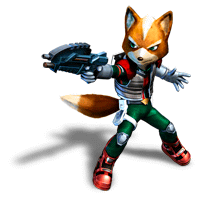 Fox, as he appears in Super Smash Bros. 4. Fox was confirmed as a playable character during the E3 2013 Nintendo Direct. 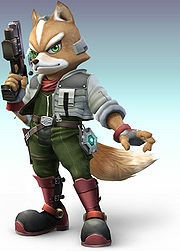 Like his appearance in Brawl, Fox's appearance is primarily based on Star Fox Command, but he appears to have higher quality fur visuals, similar to Donkey Kong. Contrary to his appearance, Mike West, his Star Fox 64 and Star Fox 64 3D English voice actor, now voices Fox. However he is still voiced by Steve Malpass in Corneria and Jim Walker in Lylat Cruise. Fox was slightly nerfed from Brawl to Smash 4, with weakened finishers, increased lag on his aerials, and the removal of auto-canceling with his Blaster. Yet, to compensate, his recovery options were improved, with Fox Illusion no longer leaving him helpless, and Fire Fox gaining more distance. He also benefits from Smash 4's general changes, such as the removal of hitstun canceling and chain-grabbing. Fox still retains his key strengths from past games, and thus ranks 7th out of 55 on the Smash 4 tier list (being tied with Sonic), having noteworthy representation and results in tournaments. Mii Gunners dressed as Fox. 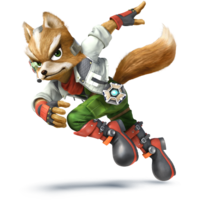 Outside of his role as a playable character, Fox's design serves as the basis of a downloadable content costume for Mii Gunners. The costume is based on Fox's appearance in Star Fox 64 3D. Fox is the leader of the mercenary unit Star Fox, often enlisted to defeat the evil Andross. His piloting skills are top notch, but in Smash Bros. he brings speed and fast attacks to the battle. His Reflector move allows him to turn projectile attacks against his foes, increasing their power for a punishing blow. Leader of the Star Fox team, Fox is a skilled pilot with a strong sense of justice. In this game, he's quick on his feet and can use his speed to toy with opponents, attacking relentlessly and giving them no room to breathe. Even if they try to attack him from afar with projectiles, his Reflector move just sends them flying right back! Fox is at home in the air, and many of his moves, like his up smash, Flip Kick, will send foes up there. It's great for KO'ing a damaged opponent. Another handy move is his up special Fire Fox. The flames that surround Fox deal damage to nearby foes, and you can launch yourself in any direction once charged. The Flip Kick that Fox does for his upward smash can really send foes flying. It's well worth pulling out this attack in combos against airborne opponents. Try following it up with his red-hot Fire Fox special to hammer them repeatedly. The fact that you an fly in any direction with this move is a real bonus too! Fox, as he appears in Super Smash Bros. Ultimate. Fox returns as a playable character in Super Smash Bros. Ultimate. He is now based off his appearance from Star Fox Zero. He has a new Final Smash which involves an Arwing strike with his Star Fox Team. Mike West returns again as Fox's voice. Fox and Pikachu are the only characters who are currently ranked at least upper-mid tier in established tier lists of every game in the series, and that have also been at the top of a tier list before. 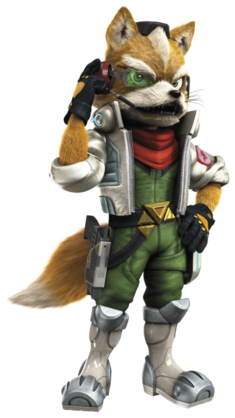 Fox is the only Star Fox representative to be a starter character in all of his appearances. Fox is one of few characters who got new voice clips in every one of their Smash appearances to date. He is also the only character from the "Original 12" to receive entirely new voice acting in every installment in the Super Smash Bros. series.